The establishment of the Ascot course is credited to Queen Anne, who offered a race, Her Majesty's Plate, of 100 guineas, to be run "round the new beat at Ascot Common, near Windsor" on 7 August 1711; the meet began two days earlier with a £50 plate race. After her death, in 1714, it wasn't until the inauguration of a Cup race in 1777 that the "Windsor and Ascot Heath Races" were reinvigorated, becoming one of the principal racing venues. By the 1790s it had become the fashionable place to be during race meets; the Royal procession up the course was instituted in 1813. A National Hunt course, laid out within the round flat course, was inaugurated in 1965. The Ascot Gold Cup has been the centre piece of the Royal Meeting from its inception. First contested in 1807, it was run as The Emperor's Plate, with a gift of plate presented by the Czar of Russia, Nicholas I, from 1845-1853. Prior to World War II, the race was often the target of the previous year's Epsom Derby winner, with three of the eleven Triple Crown winners, namely West Australian, Gladiateur and Isinglass, adding it to their win records. However, in recent times commercial considerations have changed all that, and the event is contested by the best staying horses, who often renew their rivalry over many years. In 1977 Sagaro became the only horse to win the race three times. Named in honour of the Coronation of Queen Victoria, this race is run over the round mile (Old Mile). It is the fillies equivalent of the St. James's Palace Stakes, often attracting the 1000 Guineas winners from England, Ireland and France. There was a Prince Of Wales Plate, named after the Prince Regent, run in three two-mile heats for four-year-olds, as long ago as 1789. The direct predecessor to the present race, named in honour of the Prince Of Wales, later Edward VII, was contested over 1 mile 5 furlongs for the first time at the Royal meeting of 1862. It was a 20 sovereign sweepstakes with £500 added, opened to three-year-olds, being won by Carisbrook. There were penalties for winners of the Derby, Oaks and 2000 Guineas. It was originally hoped the race would rival the Epsom Derby. Although it never reached those heights, it was won by such Epsom heroes as Galtee More, Sansovino and Hyperion. The race was run for the last time under those conditions in 1939, but was then revived at the Royal Meeting of 1968, as a race for three-year-olds and upwards, over a mile and a quarter on the round course. It was won by Royal Palace. Originally a Group 2 event, it was upgraded to Grade 1 status in 2000. 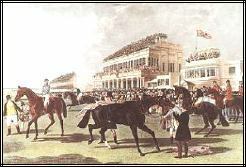 First run in 1834 over the New Mile, as a 100 sovereigns sweepstakes, for three-year-olds, with a 7 or 5 pounds penalty respectively for winners of the Epsom Derby or Oaks. The race is still run over the same distance and open only to three-year-olds, but is now run on the round course (Old Mile). Ascot is a right-handed track, and the Old Mile is a steady rise, until turning in the 2 furlong home straight, from where it is uphill, until levelling out 100 yards from the winning post. Upgraded from Group 2 to Group 1 status in 1985, this race is the first opportunity of the season for the 2000 Guineas winners of England, Ireland and France to clash. Originally run as the New Stakes over 4 furlongs, this event for two-year-olds is now a five furlongs contest run on the straight course. The race was renamed the Norfolk Stakes in 1973, to honour the Duke Of Norfolk, who had recently retired as the Queen's Representative at Ascot. In the past it has been won by subsequent Classic winners such as Blenheim and Hyperion, but now it is much more likely to be the domain of potential sprinters. Named after George, 9th Earl of Coventry, who was Master of the Royal Buckhounds from 1886-1892 and 1895-1900. Originally a five furlongs event, the distance was increased by a furlong in 1955. The Tetrarch won this race by an amazing 10 lengths in 1913, a year which saw him unbeaten in all seven starts, and prove himself the fastest juvenile of the 20th Century. In former times the race often heralded the careers of colts with classic aspirations, but more recently it has been contested by a field of early maturing juveniles. Between 1941 and 1944 the race was run at Newmarket. A race for precocious two-year-old fillies, named after Queen Mary, the wife of King George V. It was run for the first time in 1921 with a value of £2,650 to the winner, making it the fourth most valuable race of the meeting at that time. This initial running went to Wild Mint, and the race marks two of the fastest fillies of the 20th Century, Mumtaz Mahal and Cawston's Pride, on its role of honour. The race was held at Newmarket between 1941 and 1944. A Stand Plate was run as early as 1837 over 'once round and a distance' which equated to about two and a quarter miles. Renamed the Royal Stand Plate in 1858, it became a sprint for the first time under the title of the Queen's Stand Plate in 1860 and was run over four furlongs. It was renamed the King's Stand Plate with the accession of King Edward VII to the throne in 1901 and retained the name to this day, despite Queen Elizabeth's subsequent accession. Now run on the straight five furlongs track, it is one of the mid-season targets for many of the top sprinters. Named after the 5th Earl of Hardwick, Master of the Royal Buckhounds from 1874 to 1879. This race gives usually attracts a quality field of older middle distance performers, preparing for the forthcoming King George VI and Queen Elizabeth Stakes, run over the same course and distance. First run in 1838, and named after the recently crowned Queen Victoria, the prize included a gold vase. The race was renamed the King's Vase in 1903, reverting to its former title when Queen Elizabeth II succeeded to the throne. A horse with plenty of stamina is needed to win this event, run over 2 miles so early in its three-year-old career. This is the longest race in the English flat racing calendar, being named after Queen Alexandra, wife of Edward VII. It was originally run in 1864 as the Alexandra Plate, over three miles, when it was the first race at Ascot to have £1000 added to the stakes. The race will forever be associated with Brown Jack, winner of the race in six consecutive years from 1929 to 1934. Derived its name from the Royal Buckhounds, whose master was in charge of Ascot racecourse from 1711 until the accession of King Edward VII in 1901, when the Buckhounds were abolished. Originally run on the round track over 7 furlongs and 166 yards, the first running on 14th June 1843 went to Knight of the Whistle, with a triple dead-heat for second between Gary Owen, Epaulette and Bourra Tomacha. In 1930 the distance was decreased by 11 yards; it was extended to its current length in 1956. It is now run on the straight mile, but is still an ultra-competitive event, attracting a large field of the best mile handicappers, and great betting interest. Royal Ascot's earliest surviving Handicap, the race is named after a town 7 miles from Ascot. In the early days the race attracted so many entries that it was often run in two divisions. It is now run over the straight six furlongs course, and attracts a highly competitive field of seasoned handicap sprinters. First run on 21st July 1951, as the King George VI and Queen Elizabeth Festival of Britain Stakes, the race was the concept on the Clerk of the Course, Major Crocker Buteel. The race was an amalgamation of the King George VI Stakes instituted in 1946, for three-year-olds over two miles, which had been run at the October meeting; and the Queen Elizabeth Stakes, first run over a mile and a half at the July meeting of 1948, when Tenerani won from Black Tarquin. The idea was to create a truly international race of great importance, for three-year-olds and upwards, and this dream quickly came to fruition with Supreme Court, Tulyar, Pinza, Aureole and Ribot among the early winners. The 1975 renewal saw one of the greatest flat races of the 20th Century, when after a heart-stopping duel, Epsom Derby winner Grundy triumphed by half a length from Bustino, with the track record in tatters. The race is now firmly established as the main mid-summer test for middle distance horses, giving the classic three-year-olds an early opportunity to take on their elders. Run over a mile on the round course (Old Mile) at the end of September, the Queen Elizabeth II Stakes is the last major race of the season for milers, and consequently usually goes a long way to deciding the top horse in that division. Initiated in 1973, this race is run over Ascot's round mile (Old Mile) at the end of September, and is an opportunity for the staying two-year-old fillies to show their merit. Future classic winners to score in this race included Bosra Sham and Reams Of Verse. A relatively new racecourse, dating back to 1905, Newbury staged the first Lockinge Stakes on 30th May 1958, the event being won by that year's 2000 Guineas winner Pall Mall. However, these days the race is rarely contested by classic three-year-olds, but is used as an early season target for the leading older milers. With introduction of the European Pattern in 1971 the Lockinge Stakes was granted Group 2 status; it was upgraded to Group 1 status in 1999. One of the fairest courses in England, Newbury is a wide, galloping left-handed track, with only slight undulations, it encompasses a straight mile, on which the Lockinge Stakes is contested.